The Ben & Jerry’s Capture Euphoria Challenge Day 7 And #Runstreak Day 20 !! Last day of the Ben And Jerry’s #captureeuphoria challenge and we have had so much fun in the snow. After educating my kids never to make snowballs or snow angels in yellow snow we have lots of fun pictures to share. 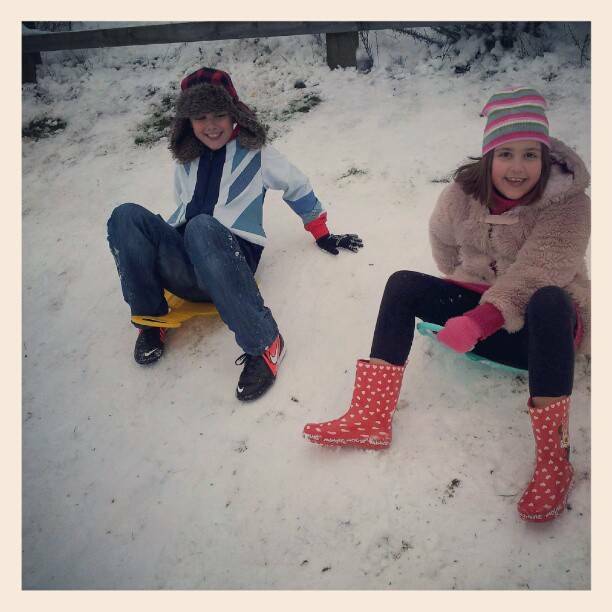 For me this one is priceless my 2 youngest having lots of fun sledging !! The smiles on there faces says it all…. To join in some fun and try to win a feature in, Ben & Jerry’s advertising in your neighbourhood upload your Instagram pictures. Today’s long run planned didn’t work out as well as I would have like. The snow is hard to run in and the lay in didn’t help. Not having time for a drink or breakfast off I trotted for my long run. 1 mile to the gym 6 miles on the treadmill (was hard work with no music counting ever second). Then a 2 miles run home!! "The Ben & Jerry’s Capture Euphoria Challenge Day 6 …"
"21/1 Creative Mondays Blog Hop…"
Great shot Clairejustine! Look at their smiles! They were clearly having a good time! Lovely photo 🙂 You ran nine miles without food or drink?! I don't know if you are awesome or mental! I didn't run today. The pavements were either ice or slush and either way they were slippy. I didn't dare risk it, although I did some people out running. I can hardly run 300 meters without feeling as if I may die, congratulations on your run streak!! Nine miles is so amazing, especially with being hungry and thirsty. I would have probably ran to the nearest food court!! Thanks 🙂 only thing is i eat loads when i get home…. Kids know how to have fun in any weather condition and I must say that you are very dedicate when it comes to your physical activities!